Ayurveda, the traditional medicinal system from ancient India, has been healing humanity through lifestyle modifications and herbal medicine for over 6000 years. "Ayur-veda," meaning the knowledge of life, suggests that our lifestyle be examined before taking medicine. This includes using Yoga practices to improve our life. Maggie integrates her knowledge of Ayurveda into both her public and private Yoga Therapy classes. She teaches privately in-person and online. Ayurveda (Aṣtanga Cikitsa) has 8 limbs, including Kaya Cikitsa (Body Therapy = General Medicine). It is a holistic (purna) system: A=B. We are a part of our natural environment and it is part of us! All disease is caused by seeing ourselves as separate from the whole, like a cancer cell that takes care of itself and steals resources from the whole natural environment. Ayurveda’s goal is to heal the body by dealing with these negative effects of prakrti. 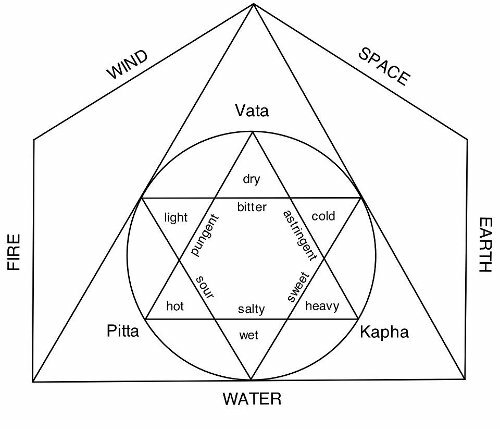 It seeks to balance the 5 elements of the body (bhutas): ether (akasha), air (vayu), fire (tejas), water (jalam), and earth (prithivi). These correspond to the 5 senses (tanmatras) respectively: sound, touch, sight, taste, and smell. These are then related to the 5 sense organs and their actions: ears, skin, eyes, tongue, and nose.